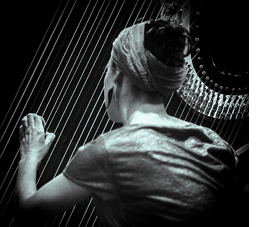 Harpist Julie Campiche’s work is an on-going process of musical innovation. Through research and experimentation she has developed the use of electronic effects that enhance the scope of her improvisational work. She has a very personnel technique and her own musical language. Julie introduced her harp into the world of jazz and contemporary music in a very organic way. She now performs in numerous European clubs and festivals on a regular basis. Through her innate curiosity and desire for new experience she plays with groups that have diverse instrumentation and esthetics. Be it theatre or contemporary performance, octets or duos, compositions or free-style improvisation, Julie infuses her music with an urgent fragility. In 2016 Julie is widening her musician’s experience and is starting in the sound design field. She got the instruction from RTS (Swiss radio and television) to create the new jingle for radio channel Espace 2.